AWS Personal Health Dashboard provides alerts and remediation guidance when AWS is experiencing events that may impact you. While the Service Health Dashboard displays the general status of AWS services, Personal Health Dashboard gives you a personalized view into the performance and availability of the AWS services underlying your AWS resources. The dashboard displays relevant and timely information to help you manage events in progress, and provides proactive notification to help you plan for scheduled activities. With Personal Health Dashboard, alerts are triggered by changes in the health of AWS resources, giving you event visibility, and guidance to help quickly diagnose and resolve issues. Personal Health Dashboard gives you a personalized view of the status of the AWS services that power your applications, enabling you to quickly see when AWS is experiencing issues that may impact you. For example, in the event of a lost EBS volume associated with one of your EC2 instances, you would gain quick visibility into the status of the specific service you are using, helping save precious time troubleshooting to determine root cause. The dashboard also provides forward looking notifications, and you can set up alerts across multiple channels, including email and mobile notifications, so you receive timely and relevant information to help plan for scheduled changes that may affect you. 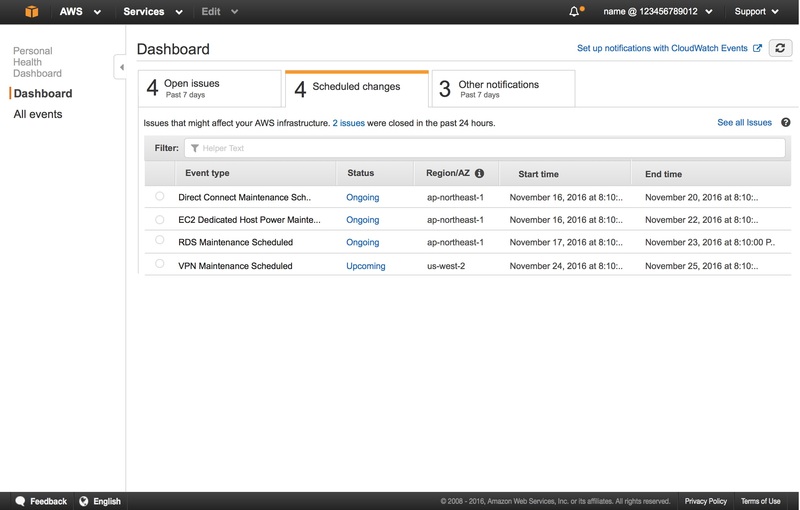 In the event of AWS hardware maintenance activities that may impact one of your EC2 instances, for example, you would receive an alert with information to help you plan for, and proactively address any issues associated with the upcoming change. 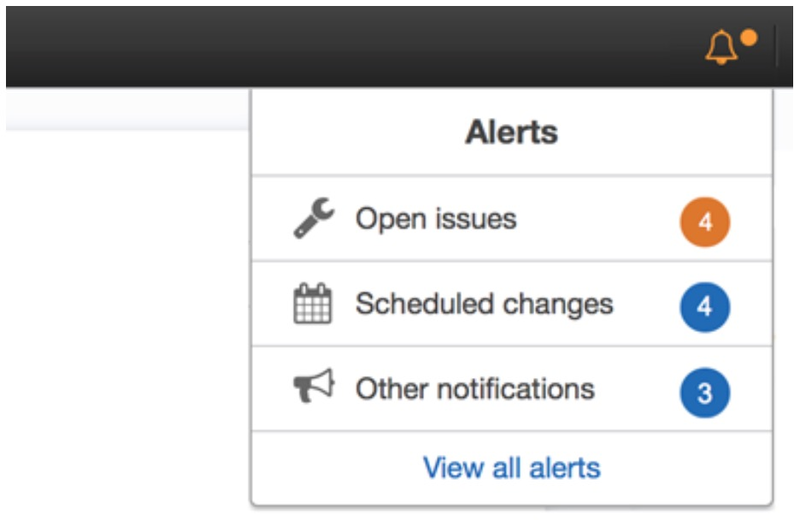 When you get an alert, it includes remediation details and specific guidance to enable you to take immediate action to address AWS events impacting your resources. 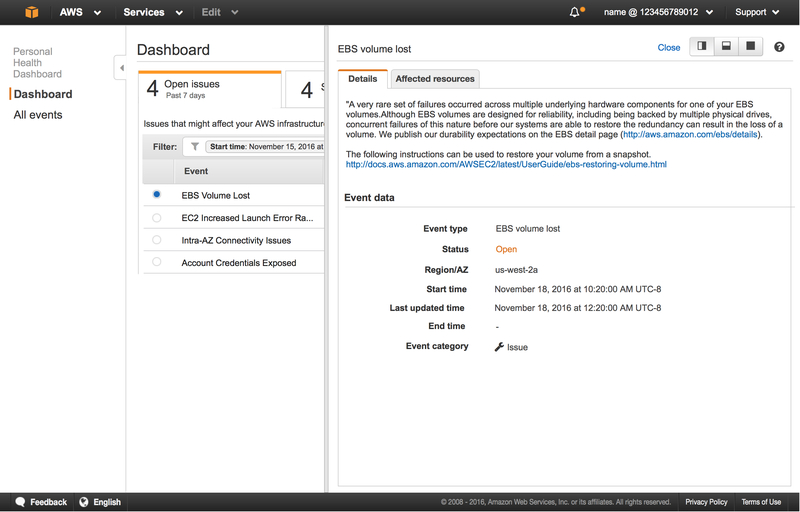 For example, in the event of an AWS hardware failure impacting one of your EBS volumes, your alert would include a list of your affected resources, a recommendation to restore your volume, and links to the steps to help you restore it from a snapshot. This targeted and actionable information reduces the time needed to resolve issues. AWS Personal Health Dashboard can integrate with Amazon CloudWatch Events, enabling you to build custom rules and select targets such as AWS Lambda functions to define automated remediation actions. The AWS Health API, the underlying service powering Personal Health Dashboard, allows you to integrate health data and notifications with your existing in-house or third party IT Management tools. AWS Personal Health Dashboard is available to all AWS customers, and provides status and notifications for all services across all Regions and Availability Zones. Access to the AWS Health API is included as part of the Business and Enterprise Support plans from AWS Support. AWS Personal Health Dashboard gives you fine-grained access control so that you can setup permissions based on event metadata. This allows you to grant or deny access to an AWS Identity and Access Management (IAM) user based on such attributes as event types, event types of a particular service, or other role-based attributes. With fine-grained access control, you can limit access of sensitive alerts, such as those related to security, to only those users that need to see them. 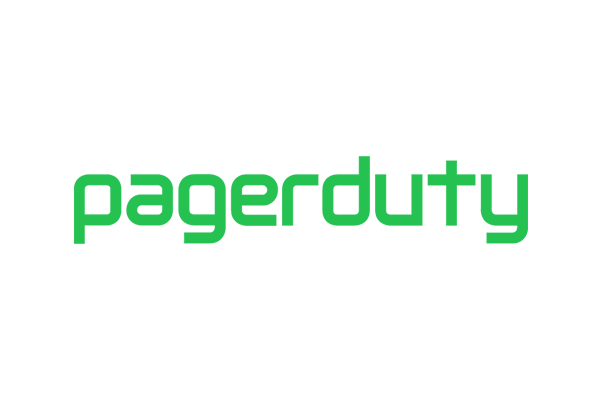 "Datadog works to provide AWS users with insight into their cloud infrastructure and applications. By integrating with the AWS Personal Health Dashboard and adding its valuable data to our platform, we'll help our customers troubleshoot issues faster and reduce downtime that affects their business-critical operations."